Population Ranked 43rd in the U.S.
Ranked 2nd in the U.S.
Rhode Island, officially the State of Rhode Island and Providence Plantations, is a state in the New England region of the United States. 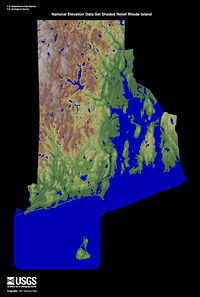 Despite being called Rhode Island in common usage, most of the state lies on the mainland. Providence Plantations refers to the mainland area, while Rhode Island is actually the official name for Aquidneck Island in Narragansett Bay. One of the founders of Rhode Island was Roger Williams. In 1636, Williams declared the settlement a place of religious freedom. Williams held that every individual should be free to follow their own religious convictions. Other persecuted religious groups soon settled in the territory. Rhode Island and Connecticut were the only two of the thirteen English colonies never ruled by a governor appointed by the king. They were allowed to run their own affairs, and many principles of the government system established by Rhode Island were incorporated into the early American government, particularly those regarding respect for individual rights. Rhode Island has a history of staunch independence. It was the first of the thirteen original American colonies to declare independence from British rule and the last to ratify the United States Constitution. Rhode Islanders withheld ratification until May 1790, over concerns of a strong central government. Rhode Island was ranked 43rd in population according to the 2000 U.S. census. Due to its small land area of 1,545 square miles (smallest in the U.S.), it is the second most densely populated. It has adopted the nickname "The Ocean State." Nearly one-tenth of its inland area is covered by salt water, with no part of the state more than a 45-minute drive from the water's edge. The Verrazzano Monument in Providence, which credits the state's name to Verrazzano's comparison of the Narragansett Bay area to the Aegean Sea and the Isle of Rhodes. The name "State of Rhode Island and Providence Plantations" can be traced back to the Royal Charter of 1663, granted to the Rhode Island colonists by King Charles II of England. The origin of the state's name is not agreed upon. Rhode Island is believed by many to come from the 1524 description of Block Island by Italian navigator Giovanni da Verrazzano, which compared it to the Greek island of Rhodes. Some sources state that it comes from the Dutch explorer Adriaen Block, who came to the area in 1614, and re-named Aquidneck Island, owing to its red soil, Roodt Eyland. The second half of the name is for Providence Plantations, the first settlement on the mainland, on Narragansett Bay, named by Roger Williams. 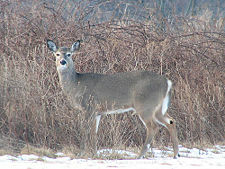 Deer in Sachuest Point, Middletown, Rhode Island, 2007. 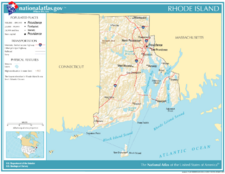 The smallest of the 50 states, Rhode Island covers an area of approximately 1,545 square miles (4,002 km²) and is bordered on the north and east by Massachusetts, on the west by Connecticut, and on the south by Rhode Island Sound and the Atlantic Ocean. It shares a water border with New York State between Block Island and Long Island. The mean elevation of the state is 200 feet (60 m). Rhode Island is mostly flat. Its highest natural point is Jerimoth Hill, only 812 feet (247 m) above sea level. The state has two distinct natural regions. Eastern Rhode Island contains the lowlands of Narragansett Bay, while western Rhode Island forms part of the New England Upland. 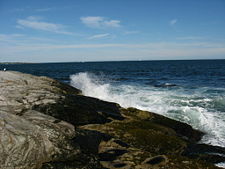 Narragansett Bay is a major feature of the state's topography. 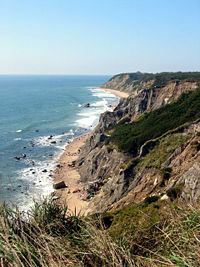 Block Island lies approximately 12 miles (19 km) off the southern coast of the mainland. Within the Bay, there are over 30 islands. 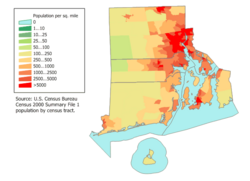 The largest is Aquidneck Island, shared by the municipalities of Newport, Middletown, and Portsmouth. Rhode Island has more than 400 miles (640 km) of coastline, with Narragansett Bay forming a deep 28-mile wedge into the state. The New England Upland region, a part of the Appalachian Highlands, covers the western two-thirds of the state. It is a rough, hilly, mainly forested plateau dotted with lakes. The eastern third of the state is also part of the Appalachian Highlands, but is itself a lowland region that is comprised of sandy beaches and salt marshes and forms the drainage basin for most of the state's principal rivers. The state's forests include white pine, oak, hickory, maple, ash, birch, black walnut, and hemlock. Cedar, juniper, and poplar grow in fields and pastures, while swamp maple grows in wet areas. Since Narragansett Bay and its long coastline dominate Rhode Island, fish, shellfish, marine animals, and birds that flock to the state's many salt marshes are common. Such woodland mammals as rabbits, squirrels, foxes, raccoons, and white-tailed deer are found in the forests, while beavers, muskrats, minks, and river otters live in the ponds. Rhode Island is an example of a warm summer humid continental climate with hot, rainy summers and chilly winters. 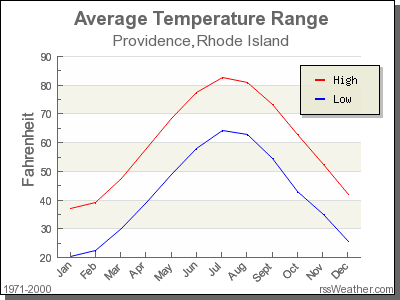 The highest temperature recorded in Rhode Island was 104°F (40°C], recorded on August 2, 1975, in Providence. The lowest temperature in Rhode Island, -23°F, was recorded on January 11, 1942, at Kingston. Monthly average temperatures range from a high of 82°F (28°C) to a low of 20°F (-7° C). In 1524, Italian navigator Giovanni de Verrazzano traversed the mid-Atlantic coast of North America, searching for an all-water route through North America to China. In March of that year, he left what is now New York Harbor and headed east until he discovered what was later called Block Island. Native Americans guided him into what is now Newport Harbor. He remained for two weeks while his crew surveyed the bay and the surrounding mainland. In early May, Verrazzano departed to renew his search for a Northwest Passage. In 1614, the Dutch explorer Adriaen Block visited the island that was eventually named for him; Block Island. Native American inhabitants included the Narragansett tribe, occupying most of the area, and the closely related Niantic tribe. Most of the Native Americans were decimated by introduced diseases such as smallpox, intertribal warfare, and the disastrous King Philip's War, but remnants of the Niantic merged into the Narragansett tribe, where they remain on a federally recognized reservation. In 1636, Roger Williams, after being banished from the Massachusetts Bay Colony for his religious views, settled at the tip of Narragansett Bay. He called the site Providence. The following year, Anne Hutchinson was banished from Massachusetts for criticizing the clergy there. She and some others, including William Coddington and John Clark, founded the town of Portsmouth on Aquidneck Island. In 1639, Coddington left Portsmouth and founded Newport, also on Aquidneck Island. That same year, a formal government was established for the island, with Coddington as the first governor. In 1644, the name of Aquidneck Island was changed to Rhode Island. John Clarke was granted a charter in 1663 for Rhode Island and Providence Plantations, which effectively united the two colonies. The original charter was used as the state constitution until 1842. The relationship between the New Englanders and the Native Americans was strained, and caused some bloodshed. The largest tribes that lived near Rhode Island were the Wampanoag, Pequots, Narragansett, and Nipmuck. Roger Williams had kept the powerful Narragansetts on friendly terms with local white settlers. This peace did not last long, however, and by 1670, even the friendly tribes that had greeted Williams and the Pilgrims became estranged from the colonists, and conflicts erupted. The most important and traumatic event in seventeenth-century Rhode Island was King Philip's War, which occurred during 1675–1676. King Philip (also known as Metacomet) was the chief of the Wampanoag tribe. The first attacks against the English were around Narrangansett Bay, but they soon spread throughout New England. The war culminated in the Great Swamp Fight, during which the colonial militia destroyed the Narragansett village in the Great Swamp in southern Rhode Island. Metacomet himself was eventually captured and slain, and 500 members of his tribe were sold as slaves. Rhode Island's tradition of independence and dissent gave it a prominent role in the American Revolution. In 1772, the first bloodshed of the Revolution took place in Rhode Island when a band of Providence residents attacked a grounded British ship for enforcing unpopular British trade regulations; an incident which became known as the Gaspee Affair. During the Revolution, the British occupied Newport. A combined Franco-American force fought to drive them off Aquidneck Island. The Industrial Revolution began in America in 1789, when Moses Brown invested in a water-powered textile mill designed and run by Samuel Slater. During the eighteenth century, Rhode Island had developed into a center of trade and shipping. Consequently, its merchants became heavily involved in the slave trade. Slavery was extant in the state as early as 1652, and by 1774, the slave population of Rhode Island was 6.3 percent, nearly twice as high as any other New England colony. In the late eighteenth century, Rhode Island merchants began actively engaging in what is known as the triangle trade. Molasses from the West Indies was brought to Newport and other ports and made into rum, which was then shipped to Africa and traded for slaves, who were transported to the West Indies. In the years after the Revolution, Rhode Island merchants controlled between 60 and 90 percent of the American trade in African slaves. A harbor view of Providence, Rhode Island in 1858 by George W. Rhodes. During the Civil War, Rhode Island was the first Union state to send troops in response to President Abraham Lincoln's request for help from the states. On the home front, Rhode Island, along with the other northern states, used its industrial capacity to supply the Union Army with the materials it needed to win the war. In addition, Newport was the temporary home of the United States Naval Academy during the war. Post-war immigration increased the population. From the 1860s to the 1880s, most immigrants were from England, Ireland, Germany, Sweden, and Quebec, Canada. Toward the end of the century, however, most immigrants were from Eastern Europe and the Mediterranean region. At the turn of the century the state had a booming economy, which fed the demand for immigration. In the 1920s and 1930s, rural Rhode Island saw a surge in Ku Klux Klan membership, largely in reaction to the large waves of immigrants moving to the state. In the twentieth century, the state continued to grow, though the decline in industry devastated many urban areas. These areas were impacted further, as with the rest of the country's urban areas, by construction of Interstate highways through city cores and suburbanization. While known for old school politics and corruption, Rhode Island, at the beginning of the twenty-first century also had comprehensive health insurance for low-income children, and a large social safety net. Despite this, many urban areas continued to have a high rate of children in poverty. Due to an influx of residents from Boston, increased housing costs resulted in more homeless in Rhode Island. The capital and largest city of Rhode Island is Providence. Providence was founded in 1636 by Roger Williams, a religious exile from the Massachusetts Bay Colony, who cultivated the settlement as a refuge for persecuted religious dissenters like himself He named the area in honor of "God's merciful Providence" which he believed was responsible for his finding such a haven to settle. The state legislature is the Rhode Island General Assembly, consisting of the 75-member House of Representatives and the 38-member Senate. Both houses of the bicameral body are currently dominated by the Democratic Party. Because Rhode Island's population barely crosses the threshold for additional votes in both the federal House and electoral college, it is well represented relative to its population, with the eighth-highest number of electoral votes and second-highest number of House Representatives per resident. Federally, Rhode Island is one of the most reliably Democratic states during presidential elections, regularly giving the Democratic nominees one of their best showings. In 1980, Rhode Island was one of only six states to vote against Ronald Reagan. Reagan did carry Rhode Island in his 49-state victory in 1984, but the state was the second weakest of the states Reagan won. Rhode Island was the Democrats' leading state in 1988 and 2000, and second-best in 1996 and 2004. In 2004, Rhode Island gave John Kerry more than a 20-percentage-point margin of victory (the third-highest of any state), with 59.4 percent of its vote. Rhode Island was the second state to abolish the death penalty, and carried out its last execution in the 1840s. It is one of two states in which prostitution is legal, provided it takes place indoors, though in 2008 state lawmakers were considering a bill that would close the loophole in this state’s laws that makes prostitution. There are 39 cities and towns in Rhode Island. Major population centers today result from historical factors — with the advent of the water-powered mill, development took place predominantly along the Blackstone, Seekonk, and Providence Rivers. In common with many other New England states, some Rhode Island cities and towns are further partitioned into villages that reflect historic townships, which were later combined for administrative purposes. The Blackstone River Valley is known as the "Birthplace of the American Industrial Revolution." It was in Pawtucket that Samuel Slater set up a mill in 1793, using the water power of the Blackstone River to power his cotton mill. For some years, Rhode Island was one of the leaders in textiles. However, with the Great Depression, most textile factories relocated to the American South. The textile industry still constitutes a part of the Rhode Island economy, but it does not have the same power it once had. Today, much of the economy is based in services, particularly healthcare and education, and to some extent, manufacturing. The headquarters of Citizens Financial Group, a $160 billion banking corporation that operates in many parts of the United States, is located in Providence. The Fortune 500 companies CVS and Textron are based in Woonsocket and Providence, respectively. FM Global, Hasbro, American Power Conversion, Nortek, and Amica Mutual Insurance are all Fortune 1000 companies based in the state. The GTECH Corporation is headquartered in Providence. 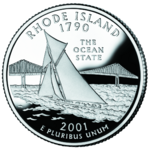 Rhode Island's 2000 total gross state product was $33 billion, placing it 45th in the nation. Its 2000 per capita personal income was $29,685, 16th in the nation. Rhode Island has the lowest level of energy consumption per capita of any state. Health services are Rhode Island's largest industry. Second is tourism, supporting 39,000 jobs, with tourism-related sales at $3.26 billion in the year 2000. The third-largest industry is manufacturing. Its industrial outputs are fashion jewelry, fabricated metal products, electrical equipment, machinery, shipbuilding, and boatbuilding. Rhode Island's agricultural outputs are nursery stock, vegetables, dairy products, and eggs. A corridor of population can be seen from the Providence area, stretching northwest following the Blackstone River to Woonsocket, where nineteenth-century mills drive industry and development. According to the U.S. Census Bureau, as of 2005 Rhode Island had an estimated population of 1,076,189, which was a decrease of 3,727, or 0.3 percent, from the prior year and an increase of 27,870, or 2.7 percent, since the year 2000. The six largest ancestry groups in Rhode Island are: Irish (19 percent), Italian (19 percent), French Canadian (17.3 percent), English (12 percent), Hispanic 11 percent (predominantly Puerto Rican and Dominican, with smaller Central American populations), Portuguese (8.7 percent). Rhode Island has a higher percentage of Americans of Portuguese ancestry (who dominate Bristol County), including Portuguese Americans and Cape Verdean Americans than any other state in the nation. French Canadians form a large part of northern Providence County, whereas Irish Americans have a strong presence in Newport and Kent counties. Yankees of English ancestry still have a presence in the state as well, especially in Washington County, and are often referred to as "Swamp Yankees." African immigrants form significant and growing communities in Rhode Island. Mount Hope Bay from Tiverton, Rhode Island 1991. Rhode Island and Utah are the only two states in which a majority of the population are members of a single religious body. Rhode Island has the highest percentage of Roman Catholics in the nation, mainly due to large Irish, Italian, and French-Canadian immigration (forming roughly 55-60 percent of the state's population). In more recent times, significant Portuguese and Hispanic communities (also largely Catholic) have also been established in the state. Nicknamed "The Ocean State," the nautical nature of Rhode Island's geography pervades its culture. Newport Harbor, in particular, holds many pleasure boats. Additionally, the large number of beaches in Washington County (known locally as South County) lures many Rhode Islanders south for summer vacation. The state was notorious for organized crime activity from the 1950s into the 1990s when the Patriarca crime family held sway over most of New England from its Providence headquarters. Although the power of organized crime has greatly diminished in the state over the last 20 years, its residents are still stigmatized by popular perceptions of rampant graft and corruption that have haunted the state for decades. Rhode Island enacted the first law prohibiting slavery in North America on May 18, 1652. Slater Mill in Pawtucket was the first commercially successful cotton-spinning mill with a fully mechanized power system in America and was the birthplace of the Industrial Revolution in the nation. The oldest Fourth of July parade in the country is still held annually in Bristol. The first Baptist Church in America was founded in Providence in 1638. Touro Synagogue, the first synagogue in America, was founded in Newport in 1763. Other sources say the first synagogue was the Mill Street, now South William Street, Synagogue in New York City, built by the Shearith Israel congregation in 1729 (or 1730), having earlier met in rented quarters, making Touro Synagogue the second-oldest in the United States. The first armed act of rebellion in America against the British Crown was the boarding and burning of the revenue schooner Gaspee in Narragansett Bay on June 10, 1772. ↑ RI.gov. Rhode Island Government : Government. RI.gov. Retrieved July 31, 2010. ↑ State of Rhode Island, State Facts and Figures Retrieved February 18, 2012. ↑ 4.0 4.1 4.2 Elevations and Distances in the United States. 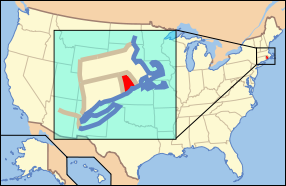 United States Geological Survey (2001). Retrieved October 24, 2011. ↑ City of Providence, The Living Bay. Retrieved September 29, 2008. ↑ RSSWeather.com, Average Temperature Range Chart. Retrieved September 29, 2008. ↑ Martin E. Marty, Pilgrims in Their Own Land: 500 Years of Religion in America (New York: Penguin Books, ISBN 9780140082685), 77. ↑ Douglas Harper, Slavery in Rhode Island, Slavery in the North. Retrieved September 29, 2008. ↑ Brown News Bureau, Slavery, the Brown Family of Providence, and Brown University. Retrieved September 29, 2008. ↑ State of Rhode Island General Assembly, Rhode Island History: CHAPTER V: Change, Controversy, and War, 1846-1865. Retrieved September 29, 2008. ↑ State of Rhode Island General Assembly, Rhode Island History: Chatper VI: The Gilded Age, 1866-1899. Retrieved September 29, 2008. ↑ The Providence Plan, Providence Neighborhood Profiles. Retrieved September 29, 2008. ↑ Cynthia Needham, Bill to close prostitution loophole, Providence Journal. Retrieved September 29, 2008. ↑ National Park Service, Birthplace of the American Industrial Revolution. Retrieved September 29, 2008. ↑ SustainableMiddleClass.com, Energy Consumption: Red State and Blue State Comparisons. Retrieved September 29, 2008. ↑ Adherents.com, Religion by Location. Retrieved September 29, 2008. ↑ Adherents.com, The Largest Catholic Communities. Retrieved September 29, 2008. ↑ 19.0 19.1 Rhode Island State Library, Rhode Idland History and Facts of Interest. Retrieved August 8, 2007. ↑ Slater Mill, Slater Mill Today. Retrieved September 29, 2008. ↑ First Baptist Church in America, The First Baptist Church in America. Retrieved September 29, 2008. ↑ Morris U. Schuppes, A Documentary History of the Jews in the United States, 1654-1875 (New York: Schocken Books, 1976). Adams, James Truslow. 1921. The Founding of New England. Boston: Atlantic Monthly Press. Adams, James Truslow. (1923) 2007. Revolutionary New England, 1691–1776. Gardners Books. ISBN 0548124973. Coleman, Peter J. 1963. The Transformation of Rhode Island, 1790–1860. Providence: Brown University Press. Conforti, Joseph A. 2001. Imagining New England: Explorations of Regional Identity from the Pilgrims to the Mid-Twentieth Century. ISBN 9780807849378. Dwight, Timothy. c. 1800. Travels Through New England and New York. volumes 1 -4. Retrieved September 29, 2008. Harper, Douglas. Slavery in Rhode Island. Slavery in the North. Retrieved September 29, 2008. State of Rhode Island. History And Facts About The Ocean State. Retrieved September 29, 2008. Rhode Island State Databases - Annotated list of searchable databases produced by Rhode Island state agencies and compiled by the Government Documents Roundtable of the American Library Association. This page was last modified on 10 July 2015, at 21:43.